No, Earth hasn't suddenly migrated next to the Sun, but everything else about this picture is awesomely real. 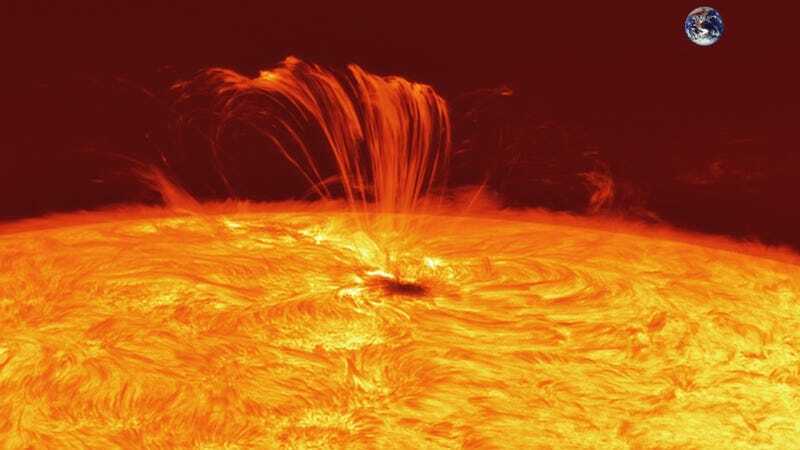 This is a plasma eruption from sunspot group AR 1302, the most recent solar storm to wreak havoc on Earth's magnetic field. One of the most active sunspot groups in years is currently crossing the Sun. AR 1302 first came around the Sun's edge last week and is so large it can be seen without a telescope. Coronal Mass Ejections from AR 1302 have already caused strong geomagnetic storms including notable aurora activity around both of Earth's poles. Pictured above, plasma was left magnetically hanging above the Sun's surface after AR 1302 emitted an X-class solar flare last Thursday. Earth is illustrated in the inset for a size comparison. Although another X-class flare was emitted on Saturday, no flares from AR 1302 have been aimed directly at the Earth, as yet. The AR 1302 sunspot group will continue to evolve but likely remain visible on the Sun for the next week.